Our high-quality, innovative aluminium bi-fold doors are built to provide you with safety and comfort throughout your home. 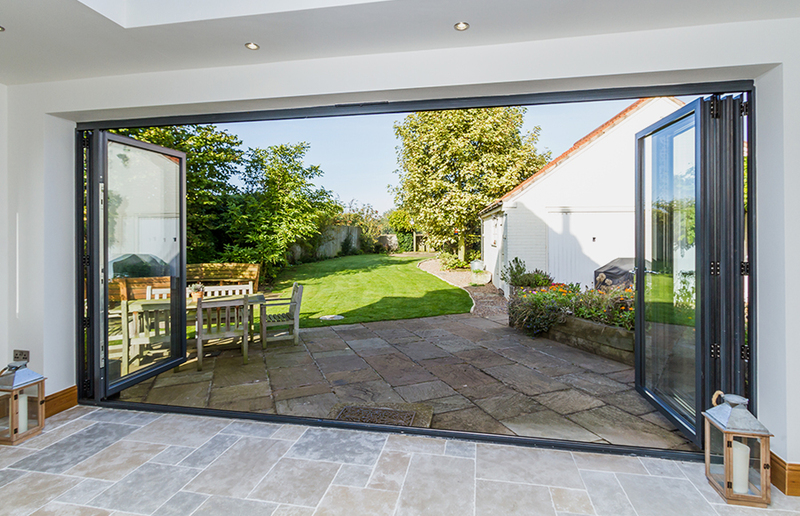 Open up your home with extending, light-adding aluminium bi-fold doors. Our new aluminium bi-folding doors range are the ideal way of creating extra space and a whole new feel to your home in Brighton, East Sussex or the surrounding areas. With our aluminium bi-folding doors, you can let in more light and connect the inside living with the outside world. Aluminium bi-folding doors are a must if you want to open up your home to the outdoors in a big way with configurations as large as 6-panes. 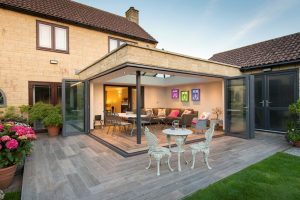 For a modern look to your home with a fantastic choice of styles and options to suit you, there’s never been a better time to get a quote on our aluminium bi-folding doors. If you would like us to measure up, supply and fit your aluminium bi-fold doors for you, A1 Glass & Glazing can turn the whole job around from start to finish in around 7 days! That’s right. Place your order with us and you will have your new aluminium bi-fold doors supplied and installed in a week. As FENSA-approved installers, we will give you efficient and reliable bi-folding door installation. What’s more, we will get it done so quickly that you will be able to enjoy your home’s new look in just a week. The best part is, these doors will be tailored according to your requirements. We can provide you with made to measure aluminium bi-fold doors that will be the perfect addition to your Brighton with a 7 day turn around. Origin is the world’s leading specialist manufacturer of aluminium bi-folding doors, which is why we have chosen them as our manufacturer. We aim to provide our customers with the best products for their homes in East Sussex. Designed and manufactured in-house by Origin, each and every door is custom made and available in a huge range of sliding and bi-folding configurations. We also work with Smarts, to provide their exceptional aluminium bi-fold doors to all our customers. With many years of experience in the industry, their market-leading folding doors are designed to transform your home. Our aluminium bi-fold doors supplied by Origin combine sophisticated style and elegance with the very latest in high performance and high security multi-point locking systems. Manufactured and assembled here in the UK, the unique 8-point locking system conforms to the standards of ‘Secured by Design’. Secured by Design is an initiative managed by the UK police to ensure homeowners are provided with the best and safest products. 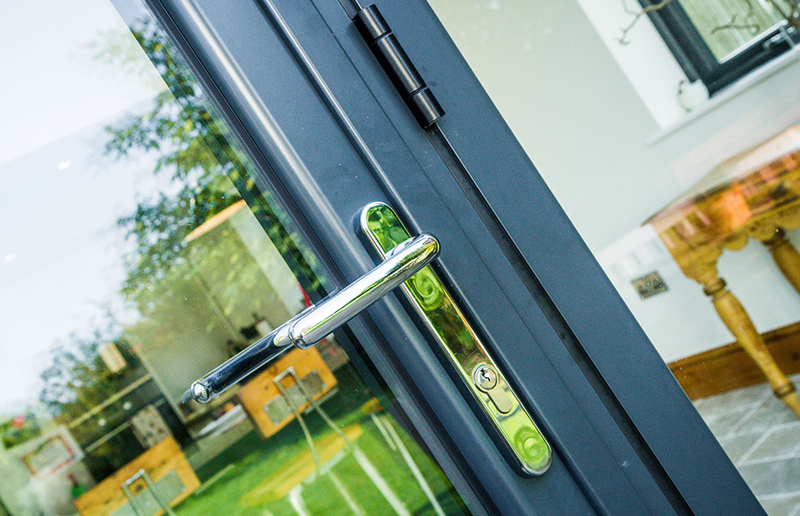 At A1 Glass and Glazing, we understand that security comes first. Chamfered 20mm linear bolts offer smoother operating when engaging the lock for your aluminium bi-fold doors. This also allows for maximum compression for increased weather resistance. Add deep throw 25mm security hooks – the deepest engagement available on the market today – and the lock delivers the best in both security and weatherproofing. Made from high quality materials, our aluminium bi-folding doors are low-maintenance so you will have no trouble keeping them looking like brand new in your Brighton home for years to come. Don’t forget the fact that all of our aluminium bi-fold doors are put through severe weather testing to ensure they can endure anything our British weather can throw at them. Please contact us to find out more. Make a statement, or simply match the surroundings of your home. Contemporary or traditional. Whether your taste runs to, the subtle or the outrageous, we’ve created a colour palette to satisfy all of our customers’ needs. These stylish double glazed aluminium bi-fold doors are available in a stunning selection of over 150 RAL colours. The options include Chestnut Brown, Anthracite Grey, Light Oak, Bronze, and much more. You can choose from earthy tones to bright primary tones and even subdued pastels. These bi-fold doors are also available in dual colours. You can match the interior and exterior frames to the décor and the façade respectively. The powder coating ensures that the colour remains bright and flawless over years. The scratch-resistant surface keeps the paint from peeling or flaking, reducing the chances of unsightly marks. As these aluminium bi-fold doors are durable and weather resistant, we know that it is important for you to choose a colour scheme for your East Sussex home that you will still be in love with for years to come. Since aluminium is such a robust material, it can hold a large amount of glazing without the need for thick frames. As a result, you get sleek and minimalist frames and a larger glazed area. Your home looks modern and ‘open’, and you get a great view and more natural light. The slimline aesthetic is perfect for contemporary homes but can be customised for any property style. What you end up with is an elegant door that seamlessly integrates the indoors and the outdoors even when it is shut. Nothing is more important than safety and comfort in your home. That’s why we prioritised them when choosing our manufacturer. The aluminium bi-fold door comes with a bespoke ‘finger safe’ seal between each door leaf, which ensures that even when they are fully open and folded to their maximum extent, there is no gap for little fingers to get trapped in. 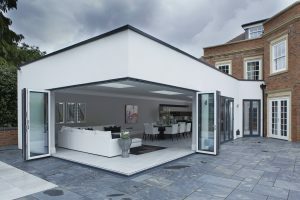 Cleverly the aluminium bi-fold door is prevented from slamming or being caught by gusts of wind by a strong magnetic stay which holds the door in the open position. The threshold design of our aluminium bi-fold doors allows the bottom track to be encased in the floor and hides away the free-glide roller system in your Brighton home. Aluminium has a reputation of being poor at thermal performance since it is such a good conductor of heat. However, our double glazed aluminium bi-fold doors are extremely proficient at keeping your home warm. They have been engineered to give you exceptional thermal performance and have a certified U-Value of 1.32. As a result, you will get beautiful doors that let in an inordinate amount of natural light, offer you great views and also keep your home warm. Our bi-fold doors will keep your rooms comfortable even when it’s cold and wet outside. Our aluminium bi-fold doors are coated with an ultra-durable polyester powder manufactured by Interpon, the world leader. With all this choice and the scope to have aluminium bi-fold doors with different colours inside and out, your options are virtually limitless. We take pride in helping you create a home that you love. 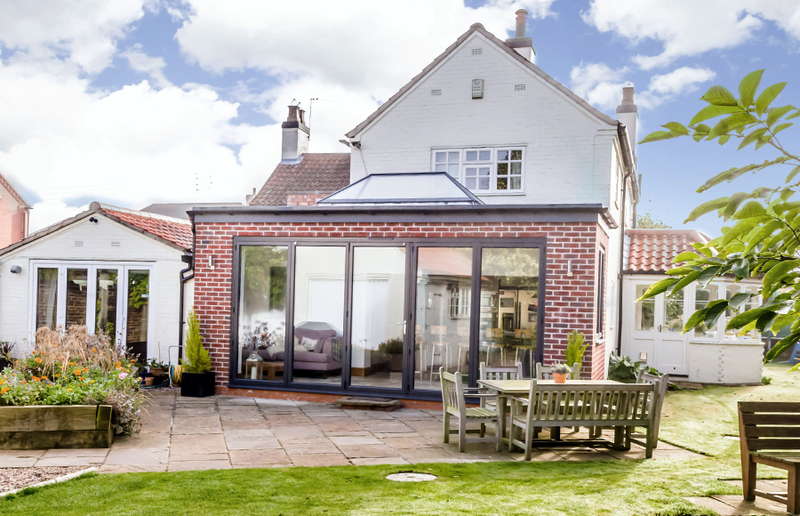 Choosing your aluminium bi-fold doors has never been easier. All you have to do is work out your rough opening sizes and how many aluminium bi-fold doors you would like in your East Sussex home. After that, leave it to us! We can help you fine-tune your layout and create the perfect design to add value to your home. Please call us on 01273 676750 to speak to an expert member of our team. We would love to discuss with you all of your options for your aluminium bi-fold doors. You can also fill in our contact form with your details to request a call back. 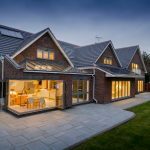 We would like to encourage you to use our free online design tool to get a quote for your aluminium bi-fold door prices as well as explore our wide range of products. We also install aluminium windows for a sleek and stylish look throughout your home.